You encounter it everywhere: sitting in a crowded lecture hall, walking down Waverly Place, and even in the quiet study rooms of Bobst. A quick puff of smoke followed by the sickeningly sweet smell of mango. The Juul, designed as a nicotine-packed electronic alternative to cigarettes and sleekly packaged to resemble a flash drive, has taken over many college campuses – including NYU’s. The use of Juuls on campus is prevalent. “I didn’t used to smoke before coming to NYU,” senior Shraddha Nair stated. Now, she says she smokes at least two pods a week. 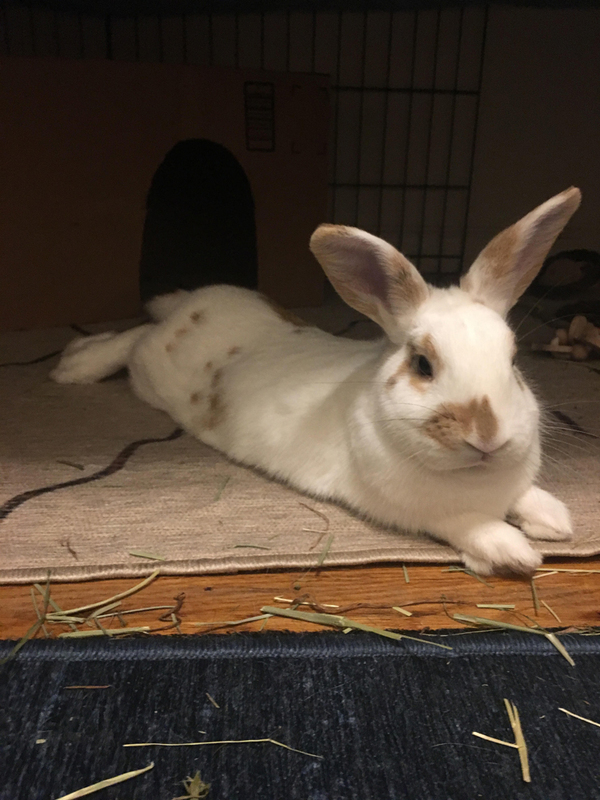 “During finals it will be a pod every couple days,” she said. A 2017 study in Sage Journals found that 16 percent of first-year college students in their sample of 2,110, from 24 U.S. colleges, who previously never used electronic nicotine products, were users by the end of that year. NYU’s Student Health Center has resources centered around quitting smoking using nicotine replacement therapy, but the resources available to people who want to stop Juuling are limited. The Health Center’s website references literature that states health officials are concerned about the consequences of using electronic nicotine devices, specifically naming the Juul. 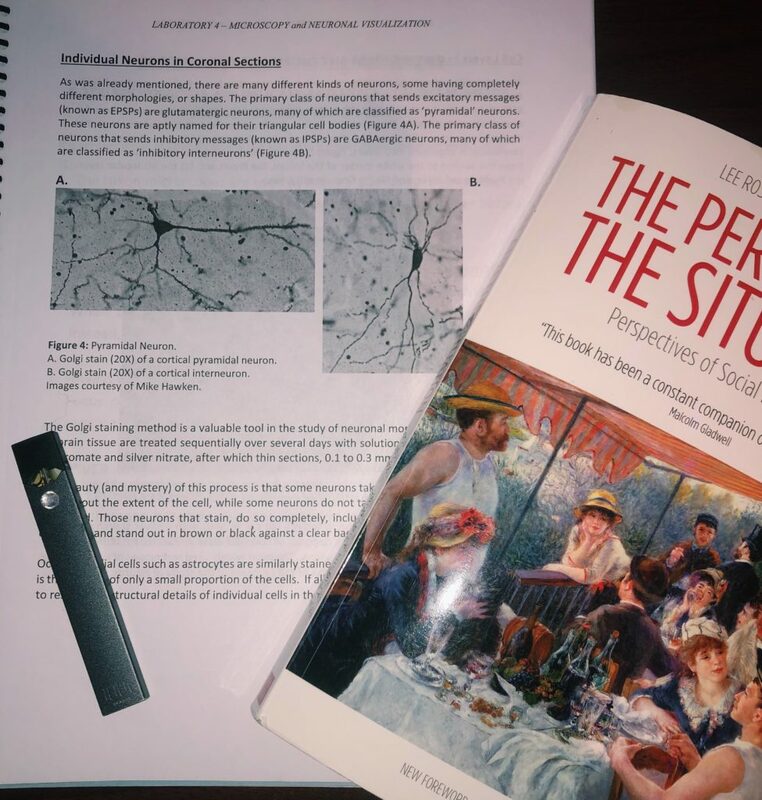 Growing concern surrounds the use of the Juul on NYU’s campus as being directly related to the high stress environment of the university. The average Juul pod contains the same amount of nicotine as twenty cigarettes. Meaning that when exam time comes, Nair is ingesting as much nicotine as if she smoked a pack of cigarettes every couple days. Villa says that the Juul has become a part of the New York student culture. “With all their advertising, with flavors, and colors, and young people, they’ve targeted college and even high school students,” she said. The small rectangle can be found being passed from student to student in meetings as likely as inside any NYC club. The vapor doesn’t hang in the air or stick to clothes like cigarettes, creating an infinitely stealthier fix for college students as they charge into their weekends. 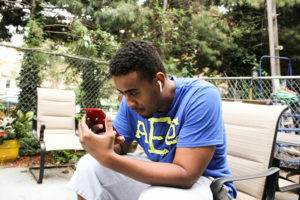 Brooklyn local Jahron Black relaxes in his backyard before heading to the New York Association for Blind Athlete’s goalball practice, a sports game specially crafted for the visually impaired. As the president of this organization and a visually impaired man himself, Black prides himself in the awareness he raises for people like him. “This was a sport that was founded over 20 years ago after World War II, to help the veterans cope with losing their vision,” said Black. Black carefully sets up the 9 x 18 meter court with wire, to assist the visually impaired players with touching the court boundaries. 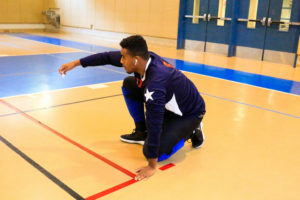 He reaches for the 4-pound ball in the back of the gymnasium, which is filled with bells in its center to assist players with hearing when the ball is volleyed back and forth. “I always call it a mix of bowling and soccer,” said Black. In the game, the court is broken down into three sections: the left wing, the right wing, and the center wing. Although all players are visually impaired, some have different levels of blindness. To make the game completely fair, all players are blindfolded. 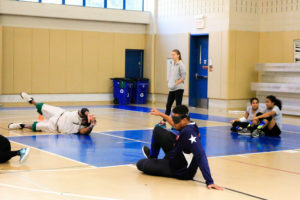 Along with being a player in the goalball league, Jahron works to teach people with vision about the game. 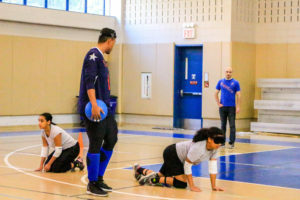 Pictured here is Jahron teaching two New York Cares volunteers with sight how to play. Apart from being involved in the NYABA, Jahron works on telling his story through rapping, which he works on from his bedroom in Brooklyn. “It is therapeutic for me. I think music is a gateway into the soul, and I pride myself for the life I live to be a connection point to all walks of life. It can change many lives,” said Black. Alex needed a place to escape. With only one year left in his University studies, he could no longer stand the threats and physical violence he faced in his home country, even if that meant leaving his family, friends, and entire life in Russia behind. Now, just a few years later, Alex, who did not want to use his full name, lives in Chicago, Illinois, where he works as a waiter and waits anxiously to hear the results of his asylum case. He fears that if has to return to Russia, he’s likely to be killed all because of his sexual orientation. In over 70 countries around the world, it is illegal to be gay. 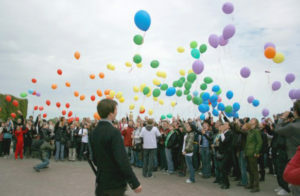 Other countries, such as Russia, have laws that discriminate against and/or promote violence towards the LGBTQ community. Fear of persecution in these countries due to one’s sexual or gender orientation could be considered cause to seek asylum in the US. 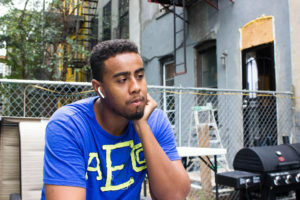 While Alex submitted his asylum application in September 2015, he did not get called for his interview until November 2017. Now over a year later, he is still waiting to hear the results of his case. In the meantime, Alex is able to live and work in the US legally, but the future of his stay is uncertain. If his asylum claim is rejected, Alex and his lawyer will have to appeal the case, which could take another few years. If his appeal is denied, he must return to Russia, where he will be locked out of entering the US. Alex’s lawyer, Timothy Knudsen, worked with him to put together a case to show that he would be in danger if he were to return to Russia. Knudsen said that showing that the LGBTQ asylum seekers whom he has worked with will face danger if they return home is frighteningly easy. In the past few months, the Trump administration has rescinded asylum protections granted to the victims of domestic violence. Knudson says this could indirectly harm some LGBTQ applicants, since domestic violence issues are often a part of their cases. But, the administration has yet to take any direct action to limit the number of LGBTQ applicants accepted into the US. Another obstacle for asylum seekers can be the act of getting out of their native countries in the first place. Rainbow Railroad is a non profit organization that works to get LGBTQ people out of countries where they face persecution. While getting those at risk out of their countries is the most urgent goal of Rainbow Railroad, ultimately the organization hopes to see a safer world for LGBTQ people, no matter where they are. The closing of NYU Coles Sports and Recreation Center on campus, has taken student athletics events off campus. It is a brisk Friday night in December at New York University. Despite the low temperature outside, students are buzzing around campus. Some are headed to Bobst Library to begin preparing for their finals. Others are walking to Weinstein dining hall to grab a quick bite for dinner. But very few students are making the 35-minute trek to watch their school’s ice hockey team play at Chelsea Piers Sky Rink. Even with a population of over 60,000 students, NYU struggles to get students to attend the school’s athletic events. With sports teams that play at facilities that are far from NYU’s campus, athletics are not a central feature of NYU and often fall on the back burner. The NYU community’s lack of interest in sporting events has impacted both the student-athletes and the overall sense of community at NYU. NYU’s Senior Associate Director of Athletics, Janice Quinn, said that one of the main reasons why games are poorly attended is because they are so far away. 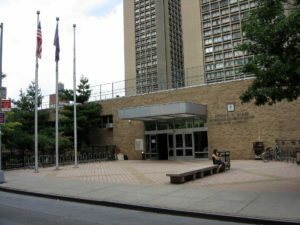 NYU’s Coles Sports and Recreation Center was demolished in 2016, as part of a renovation project, and many of NYU’s athletic fields are located outside of Manhattan. As a result, the morale of student athletes has taken a hit. Olivia Mould, a senior on NYU’s softball team said that she thinks this bleak turnout has an effect on her performance on the field. NYU sophomore cross country and track athlete, Oliver Jacob, said as a runner, fan support would really help to enhance his performance. “In track it helps not necessarily to know who’s cheering for you, but to hear a lot of cheering gets the adrenaline pumping,” said Jacob. Quinn said the low attendance has also impacted the overall sense of community at NYU. Through her 37 years of involvement with NYU’s athletics department, beginning as a student athlete on the women’s basketball team in 1981, Quinn has seen a missed opportunity to establish a community through sports. Despite the current low level interest surrounding NYU’s athletic teams, Quinn believes that there is still the potential for sports to generate spirit, and create a greater sense of camaraderie and unity on campus. 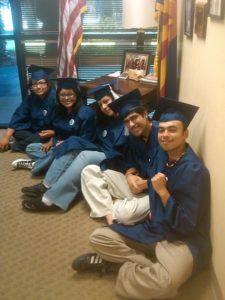 Arizona Students protesting on behalf of the DACA. With exams, papers, and presentations looming, Carlos Alvarez, 20, sat tucked away in his Dallas, Texas, community college library away from all of the noise. Notes, pens, and the odd Starbucks coffee cup could be seen strewn across the table, making Alvarez’s workspace identical to all of those around him. But Alvarez is very different from his classmates. While they could look forward to prestigious internships and imagine their lives after college, Alvarez’s future is uncertain. He is a recipient of Deferred Action for Childhood Arrivals or DACA , which means Alvarez is undocumented. With DACA, Alvarez is able to attend college and also have a job. But on Sept. 5, 2017 the Trump administration terminated the DACA program. According to the Immigration Legal Resource Center, the fate of the DACA program is being litigated in four different parts of the country at this time. The most recent update came on Aug. 8, 2018 when a Texas Federal judge heard a case in which several states aim to shut down the program entirely. According to the Migration Policy Institute, 1.4 million Mexican immigrants made their way to Texas from 2012-2016. Alvarez’s family immigrated to Texas in 1999. Today, Alvarez’s trip to the U.S. is not what is seen as the norm. Many media outlets such as CNN have reported families being separated for long periods of time. As well as some migrants being teargassed on Nov. 25, according to Reuters. “Everyday since October 26th, immigration authorities have released 20 to 30 families into San Diego tagged with ankle bracelets and without any resources or way to reach their final destination,” said Sandy Young a spokesperson for San Diego Rapid Response Network. According to SDRRN, this drop and go tactic by Immigration and Customs Enforcement, or ICE is a new policy adopted by the organization. This change occurred after ICE ended its “safe release” program which ensured that families had somewhere to go after entering the U.S. Even if these migrants made it to the U.S. seemingly unscathed, the better life for their children some were hoping for, may not be as attainable as they had originally thought. On top of not being able to leave the country, DACA recipients cannot commit major crimes or else they will be deported from the U.S. Including being worried about his own future, Alvarez continued to express concern for those attempting to immigrate to the U.S. today from Latin American countries. In addition to fearing for the safety of migrants on their journey to a better future, another concern of his was how the Trump administration’s current policies for dealing with migrants is exacerbating the issue of migrant treatment once they are allowed into the country. While tear gassing migrants can be seen as a step too far, Trump’s anti-immigrant rhetoric has also been noted as being detrimental to the validity of migrants asylum claims. A crowded New York City subway car. A common site for commuters. The 6 Lexington Avenue Local subway cars rattled into the 110th street station, the rusted brakes shrieking loudly. The rats on the rail lines squirmed and scurried away and the piles of trash on the tracks disappeared as the train rolled in. The train is late as usual. The cars are all packed tightly with New Yorkers heading uptown, knuckles white on the hand poles as the failing train lurched violently and continued, still screeching. 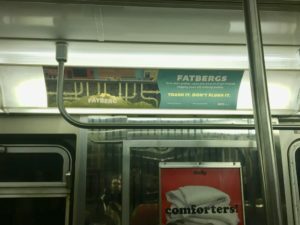 With the subway system falling apart, the MTA has proposed raising the fare from $2.75 to $3 by March 2019 to secure the funding desperately needed for repairs and maintenance. But the proposal has been met with harsh criticism from commuters who are already fed up with transit in the city. The effects of this increase would hit the city’s commuters the hardest as they travel to and from work everyday. Crystal Fajardo, 28, of the Bronx, is one of these people. The proposal by the MTA is just one addition to a seemingly never ending series of increases. “In ‘69, when I started at NYU, the fare was 16 cents,” said Alex Grant, 70, of the Bronx. To Grant, it is wrong to put the responsibility of paying for the much needed service on individual riders. Instead, he would prefer to see the state take more control. Many New Yorkers have turned away from the subway to taxis or services like Uber, worsening the problem of traffic congestion in the city. For the second year in a row, the subway ridership has dropped. Still, many New Yorkers prefer the subway for their commute rather than facing the traffic. 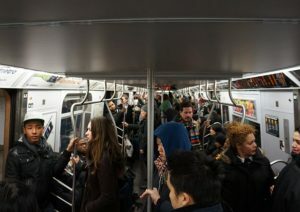 Facing either subway or the gridlock of traffic, many New Yorkers will have to “take it as it is” and pay the high fares come March. As the fall school semester comes to an end once again, frantic high school seniors are submitting college applications, crossing their fingers, and dreaming of getting in to their dream schools. What they don’t know is that come next year, they might be going through the same stressful process all over again as transfer students. In a 2015 study of the 3.6 million first-time students who entered college in the fall of 2008, over a third transferred to a different institution at least once in the next six years, most (50.7 percent) within the first two years. In a New York Times article from earlier this year, executive director Janet Marling of the National Institute for the Study of Transfer Students at the University of North Georgia, said that transfer students are receiving the most positive attention from higher education than ever before. 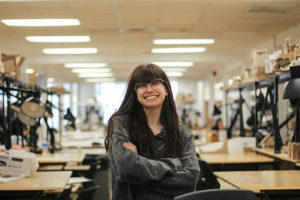 Gianna Robertson, an Interior Architecture major at The New School, was one of those students. Working on her final project on one of the various paint-stained work tables at the studio on East 13th Street, Robertson recalled the disillusionment she felt while pursuing acting and singing after graduating from high school and moving to California. She decided to move back to her home state of Pennsylvania to attend community college, where she would take art classes, get her GPA up, and then transfer to a four-year institution. According to a recent article from NPR, transfer students are an established pool for universities to recruit more diverse students, especially students from community colleges. Like Robertson, almost a quarter of all students who started at a community college transferred to a four-year institution within six years. Robertson said she wouldn’t change anything about her past, and is glad for the experiences she gained in order to get her to where she is now. “It doesn’t matter how old you are. It matters what you’re doing right now,” said Robertson. Transferring can be a second chance in the competitive world of college admissions. While some schools transfer acceptance rates are much lower than regular admission, others are favorable to transfer students. Vanderbilt’s freshman admission rate in the 2016 – 2017 school year was 10.9 percent, but the rate for transfers was almost 30 percent. Larrimer attended the Liberal Arts and Science Academy (LASA), a magnet high school in Austin, Texas. Ranked at #16 in the nation for Best High Schools and #5 in Texas by US News, she said the competitive environment contributed to the pressure she felt her senior year. Students who don’t receive that coveted acceptance letter from their first or even second choices can feel like there are no other options for them. This fall, Princeton University reinstated it’s transfer program, admitting the first class of transfer students since 1990. This move, and other colleges increasing openness to transfer students, was reportedly motivated by the desire for students with more diverse backgrounds. This means lower-income families, students from community colleges, and students with military backgrounds. Larrimer’s college decision process was also limited financially. 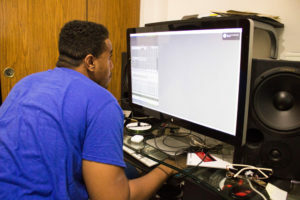 “One of the reasons I had to go to Southwestern the first year was because that was the only school that my family could afford out of the three schools I got into,” said Larrimer. Vanderbilt meets 100 percent of need-based financial aid for transfers, so now Larrimer is able to go to her dream school and afford it. Transferring can bring hope and opportunities for students who otherwise wouldn’t have them. Larrimer said while both times the college application process was stressful, confusing, and seemingly nonsensical in decision making, she’s glad she took advantage of applying as a transfer.